I also read Kate Messner's Over and Under The Snow. What a beautiful picture book full of poetic language, imagery, intimate moments, and even knowledge about what a complex world of animal survival happens during the winter. 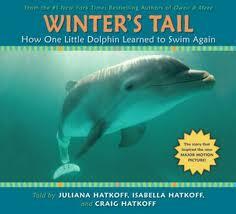 I would use this book to teach about figurative language and focus, as well as about seasons and habitats. I started Horten's Miraculous Mechanisms by Lissa Evans over the summer and forgot it at the beach house, so when we went there for an overnight, I returned to it, re-reading the beginning. Maybe the hiatus impacted my enjoyment of this one, but I have to say that I struggled to get into it. I also really enjoyed the explanations of the magic so I was a little disappointed with the ending--I won't say more so that I don't give it away for people who are intending to read it. I would be curious about other people's reactions to the ending, though. We always visit a local book shop when we are in Rhode Island and I read many picture books while my girls decide on books. Yesterday, I read Eleanor Quiet No More by Doreen Rappaport and I loved reading about her. I think that Eleanor Roosevelt is such a strong role model for today's women, young and old, since she is someone who embraced her beliefs and shared them with a strong, but polite, voice. I love hearing stories about her life and this book is full of them. Since the Newtown tragedy, what is really important has shifted dramatically and thinking of blogging topics has been hard. However, our work in education continues, so Melanie and I have been talking and thinking about the really important elements of teaching literacy to children. When we think about our writing workshops, an important component to never forget is establishing the existence of an audience for children. Audience is so important for writers. Even as I write now, I am thinking about audience. Who will be reading my piece? How formally should I write? What do my readers already know? What is safe to assume about these readers? These questions guide my writing and we should teach students that these sorts of questions should guide their writing, as well. Earlier this month, I was working in one of the second-grade classrooms with students in the middle of their “All About” writing unit. One avid writer was working on her all about book on being a second-grader. “I have twenty-four chapters mapped out,” she announced at the end of the mini-lesson. 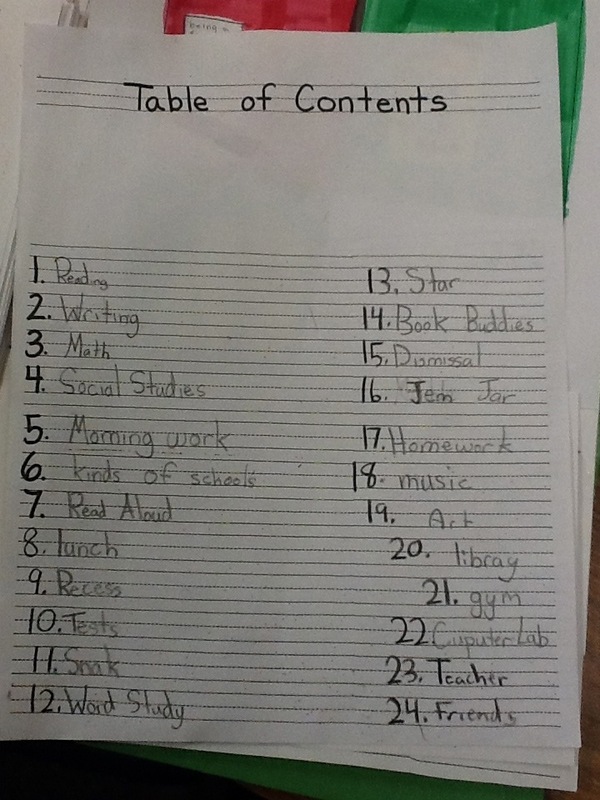 She showed us her table of contents, pictured on the right. Her teacher and I exchanged a look; I know that my concern was that I didn't think that this student would be able to maintain the focus and depth that I would hope that she would develop. Her teacher and I sat down with her together and when I asked her about her audience, she wasn't sure. Maybe her classmates. Maybe her teacher. Her teacher...did I mention that her teacher is pregnant and that a long-term substitute will be taking over the class at the end of January? As she continued to explain her book, I asked her if she would be interested in having the new teacher be her intended audience. Her eyes grew wide. "You mean have my book be used to tell the new teacher about our class?" she asked. "Think of the new teacher as your audience and then let her know what she really needs to know," we responded. Since that conference, Emily’s voice has been clearer and more purposeful as her writing speaks to her new teacher. Although I am not in her class every day, she finds me in the hallway and she tells me about her progress. She has even brought pages to my office to share with me. She has information that she wants her teacher to know and she is creating a cohesive and important piece of work. How different her writing would be if she were writing for a new student? And, how much more engaged is she because it is not just an all-about book; it is an all-about book with an intended audience and a clear purpose. Writers have power in our world and the more that we can communicate that fact to students, the better our results will be. Writers can teach, inform, persuade, and entertain. On Thursday night, my daughter's high school basketball team played Newtown. Newtown, CT. We sat in the stands with the Newtown parents and cheered for our daughters. Today, I mourn for those parents. I don't know which of them have children, relatives, or friends who were killed today. And I can't stop thinking of them. I arrived home today as my youngest daughter got off the bus and just thought about how lucky I was that she was getting off that bus. Only such a fine line between me cheering for my daughter and the mother down the bleachers who had travelled from Newtown to cheer for her daughter. As a teacher and coach, I have worked extra hard this week to compliment children since it was a week designated by my PLN as an extra kindness week. One of my favorite posts of the week was from Paul Bogush about not being able to save all of our students, a post that he wrote before the tragic events of today. His post was a powerful reminder to talk to students. Paul asked students what they wished he did more and one student responded that he wished his teacher had talked to him more. I shared Paul's post and had been mulling around a response, but after today, my response in infinitely more emotional and raw. Talk to students. Pay attention. Recognize when someone is hurting and seek out opportunities for acts of kindness. What if someone had been a mentor to the shooter? I'm sure we'll hear more about him, but initial reports indicate that he could have used that. Maybe somewhere in the course of his life, someone would have mattered enough to him to set him on a different course, and that person would have never known how much he/she mattered to Newtown families. We don't always know the impact of our actions and words but maybe the time we take today to check in and pay attention matters. Maybe. I can keep hoping that we do better with mental illness in this country, and I can keep hoping that we make it much, much harder to obtain weapons. I may even become more vocal about these issues. When something as horrific happens in our world, we tend to seek action and try to make something happen. Christopher Lehman wrote an incredible post here urging our leaders to enact tighter gun control laws. Oh, I admire this post, although I have yet to read it without crying. For now, my action will be to increase my vigilance. To pay attention to the open door in our school and close it, to remind the well-intentioned students who open the locked door for me not to, to wear my ID badge and make sure that the adults in our building belong there. But more importantly, to notice the hurting child and do something for that child that matters. Last week, each student in my class set up their own Google Drive account - thank you Bryan! :) The students were beyond thrilled to get started using their Google Drive and loved the idea of being able to share writing with one another and me whenever they want someone to see their work or want feedback. They were super excited to find out that they can work on the same document at once with someone else - perfect timing for our mini-research clubs in nonfiction! First, each student created a folder labeled "______'s Portfolio" and then created sub-folders within their portfolio for each subject area. Then they shared their portfolio with me so I can have easy access to all of their work from anywhere...school, home, and on-the-go using iPad/iPhone. Students started using their Google Drive this week when we started our nonfiction research in reading and writing workshop. Students are sharing their notes, summaries, research plan, sources, and so on with one another as well as leaving comments for one another and working on documents together - it is awesome! I love being able to see what they are working on and even while they are in the process of typing and talking with one another about their research - I get to see their collaboration in action and it is powerful. "It's great to share notes with my research group and comment with one another at home." "It's easier than working alone and then consulting when we get back to school because you can both work on the same document at the same time and look at each other's work and revisions." "It's easier to save and share documents because you don't have to worry about forgetting your flashdrive and it autosaves for you while you work." "It's convenient because you can continue to work with partners and group at home without having to be in the same place." Last week, my class started the nonfiction research part of our nonfiction unit in reading workshop and we launched our Research Based Argumentative Essay unit in writing workshop. 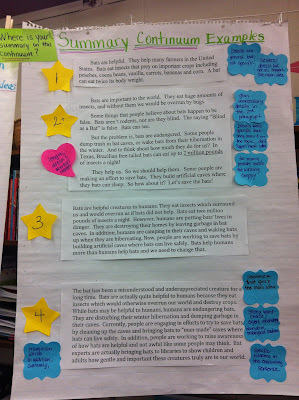 This is the first post in a series about our Nonfiction Research and Argument Essay unit. Students are in mini-research clubs and have chosen an issue to research by first choosing a topic that interests them and that they want to learn more about. Then the narrowed that topic by identifying an issue/subtopic within the larger topic and an essential question that will guide their research. Should students in elementary school have cellphones? 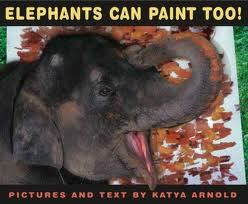 Should elephants be entertainers in circuses? Should animals be grouped by species/type in zoos or mixed all together to form relationships with other animals? Should students under the age of 12 play contact sports? Should school cafeterias serve chocolate milk or only white milk? Is global warming causing polar bears to become endangered and possibly extinct? In the mini-research clubs, students are reading various articles/texts (hard copies and online) and watching video clips to research both sides and the evidence that supports both sides of the claim they are researching. While reading and viewing, they are annotating the texts and taking organized notes in a separate research notebook. Some students have chosen to create tabbed sections within the notebook to clearly mark the evidence they are collecting for both sides as well as a section for sources they are using. Other students have chosen to not use tabbed sections but just label each page "For/Against, Pros/Cons, or Yes/No" depending on their essential question they are researching. Some students are also color coding their notes by using one color pen for evidence "for" and another color pen for "against". I love seeing how students are approaching the research and note-taking differently and sharing their strategies with one another - such powerful inquiry and learning from one another! So many of my book recommendations come from teachmentortext.com, a website that links many bloggers and lets us all share what we have read over the week. I appreciate our hosts, Jen and Kellee for all of their recommendations and for their great blog hospitality! I read Sophia's War by Avi over the weekend and I recommend it for upper elementary students, especially if you are studying the Revolutionary War. I love reading historical fiction and gaining new perspectives. Sophia's War weaves in history, as well as lessons in empathy, decision-making, ethical behavior, and universal conflicts during times of war. Avi wrote the story in first person and, at times, Sophia addresses the reader directly, a craft move that would be fun to teach. I think this would be a great read-aloud to parallel a social studies unit and I would love to hear if anyone has already used it as such. I also just received my copy of The Best Story by Eileen Spinelli. I have been waiting for this book and it was worth the wait. What a great book to use within Writer's Workshop to teach what is really important in stories. Such a simple story line with such an important message about writing! Since I had time to spend with one of my daughters at Barnes and Noble, I also caught up with some of the recent recommendations from many of you. I loved Pete the Cat and His Four Groovy Buttons by James Dean. My teenage daughter thought I was too easily entertained but I can't imagine younger students not loving this book. She admitted that The Duckling Gets a Cookie by Mo Willems is funny. If you haven't read his latest, I recommend it. I have loved watching first-grade teachers use Mo Willem books to teach students how to study and draw facial expressions. 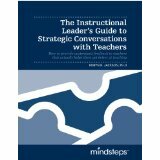 Professionally, I have been reading the Instructional Leader's Guide to Strategic Conversatons With Teachers by Robyn Jackson. This book has many practical tips, charts, and worksheets to help administrators, evaluators, and coaches work with teachers at all levels. More to come about this book, as I am thinking a lot about the categories of teachers that Jackson describes. 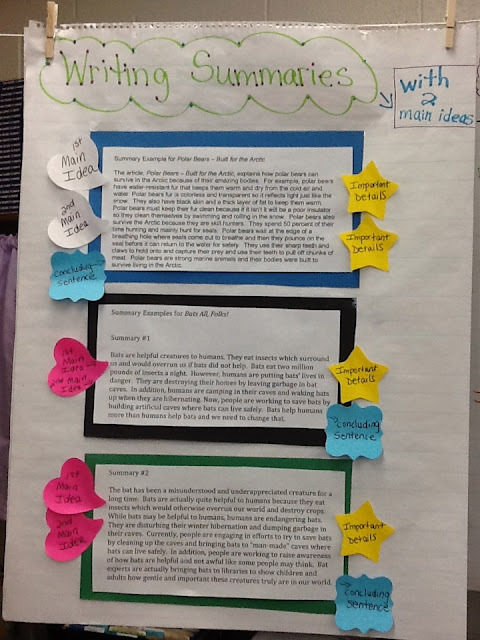 This is the second post about writing summaries within our nonfiction unit. To read my first post, please click here. 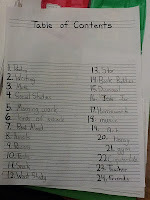 To read my other posts about note-taking in our nonfiction unit, click here. 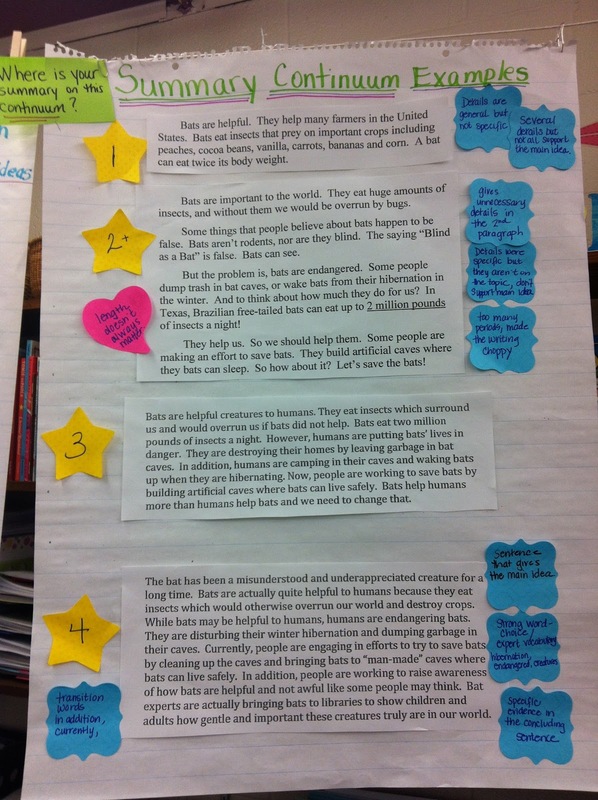 Last week, we started writing summaries for nonfiction articles with multiple main ideas. I modeled reading an article and identifying two main ideas by using the sections and subheadings in the article. After annotating the article with students, I shared the summary I wrote about the article and had students turn and talk to share what they noticed. We labeled the parts of the summaries just like we did with our summaries that contained only one main idea in our previous mini-lessons. After the mini-lesson, students went off to write their own summaries for a nonfiction article of their choice and used my summary as a mentor. At first, I thought that students would have difficulty writing summaries with multiple main ideas, but they proved me wrong - they did really well! We had a great conversation during our reader's share that day and students shared strategies they used to help determine the multiple main ideas and how they included them in their summaries. Once students were able to write solid summaries with two main ideas for a nonfiction article that has subheadings/sections, we began to work on writing summaries for articles without those expository features. To begin this work, students had to first determine the underlying main ideas within the text and label them as they annotated the article. Again, students had success writing summaries with multiple main ideas and shared strategies with their classmates and added more mentor summaries to our bulletin board for classmates. This week, we created our own summary rubric for our classroom by using summary examples and annotating them. As a class, we read four different summaries for the same nonfiction article and leveled them 1-4 with 4 being the strongest summary with clear main ideas, specific and important details that support the main ideas, and specific word choice. As we moved the summaries around on the chart (I used removable tape to help move the summaries around), we annotated them using post-its to jot down the characteristics of each summary. This helped students understand the characteristics of summaries at each level and think about where their own summaries would fall on our continuum. Students went off with their writing partner to read and reflect on their own summaries using the continuum and annotating their own summaries. Over the last couple of weeks, I was able to participate in a district workshop with Teachers' College Staff developer, Kate Roberts and attend a TC workshop in New York on the non-fiction unit and argument writing given by Annie Taranto and Mary Ehrenworth. Both of these days of professional were full of new ideas and strategies. I have tried to consolidate at least some of my notes into a chart of predictable problems and possible solutions, as students navigate non-fiction and summary writing. Students do not recognize the main idea. Try post its in order to have students sort and categorize more easily. Use one color for details and another for main ideas. One more color could be for the central idea. Also, synonyms and lack of vocabulary may get in the way of students finding the main idea. Pay attention to whether students are understanding and knowing all of the key words. Students struggle with the central idea. Students don’t recognize the voice or perspective within a non-fiction text. Teach them to read closely the introduction and conclusion since those are places where perspectives tend to hang out. Students miss the math component of the reading. 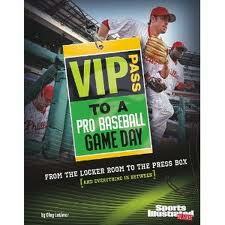 Non-fiction books frequently talk about percentages and statistics and some students need additional explanation. Students are able to summarize but not interpret. What information is included and what information is left out? Students see themselves as experts after reading one article; they don’t see the need to explore other texts. 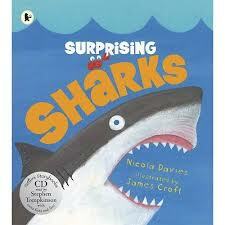 Create and be creative with text sets; Sharks could be a text set with dangerous animals. *Also* TC has a great website for digital text sets where they have collected many articles, videos and books about specific topics. This is a great resource! 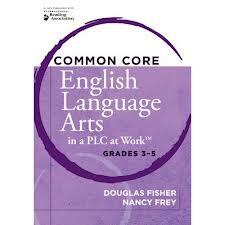 I have been reading and loving Common Core English Language Arts in a PLC at Work Grades 3-5 by Douglas Fisher and Nancy Frey and I highly recommend it! I will definitely be posting more about this professional text soon so stay tuned! Since I have been reading more professionally this week, I thought I would share some of our nonfiction read alouds that we read and enjoyed in class last week. 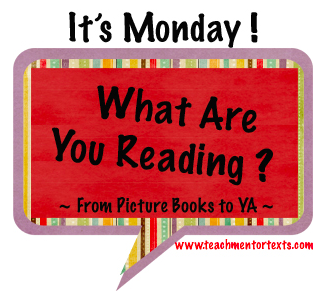 I will be posting photos of our read aloud charts from these texts in the Bulletin Boards and Charts section of this blog (I continue to add to this section with photos from our 5th grade classroom). I have to admit that I fell prey to an addictive adult fiction book, so I've neglected my TBR stack of children's literature. However, I did get through The Great Unexpected by Sharon Creech, a book that many of my blogging friends have recommended. I'll join the recommenders and I will add that this is a book that really requires close reading, since all of the parts and people are connected. I also read The Curious Garden by Peter Brown and for anyone who has visited the High Line Garden on the west side of New York City, you should not miss this book! It's also a beautiful story for any teachers who are interested in promoting gardening or teaching about environmental issues. Enjoy! When I visit writing classrooms, I frequently notice how much adults do for students--especially for students with IEP's. Adults translate so many lessons for students--where to add details, how to add more specific words, where to include an anecdote. They do a great job at making that particular piece better, but what is the message and the teaching that their students are receiving? Last week, I presented a workshop on writing instruction to our district's Special Education paraprofessionals. Since one of my favorite messages from Lucy Calkins is "teach the writer and not the writing", I decided that part of my presentation would be about Lev Vygotsky's zone of proximal development, "the distance between the actual developmental level as determined by independent problem solving and the level of potential development as determined through problem solving under adult guidance, or in collaboration with more capable peers." My workshop centered on how we could provide the most effective support for our most struggling learners and one of the take-aways that I wanted to give was that we should teach students within the middle ring. So many times, I hear adults in the room telling students exactly what to do since most of our students with IEP's are several rings away from the dark purple circle that represents independence in the above model. 1. A set of commonly owned household pets. This was easy for them and they quickly recognized dog, cat, bird, and bunny. 2. A set of the last names of the district secretaries. I had to encourage them to collaborate but once they realized that asking each other was allowable, they were able to solve these five word jumbles. 3. A set of the last names of famous Russian and Italian painters without any access to technology. For this last one, I purposely rushed them, pronouncing the names and pressuring them to write the answers. Then, I spelled the names, but I spelled them quickly. "I liked the second task best--it was fun when we could figure it out." "She really annoyed me when she spelled those names so quickly." "How were we supposed to know how to spell those names?" "No wonder the kids act out!" increased appreciation for the frustration people feel when they need to be told how to complete every step. increased curiosity of how to break down the task of writing so that what we ask our students to is what they are able to do with guidance as opposed to constant supervision.